We make your and our life pretty easy; We have only 2 Packages. 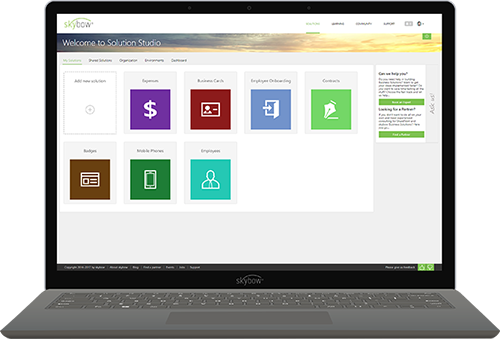 You can pay for "Solution Studio" an all-inclusive license for an unlimited number of solutions or do the same for our famous "Forms". All at very reasonable prices and based on the number of end-users. Oh, and we never charge you to develop and test anything with 1 user. That’s it. That’s our pricing model. Your very cost-effective package based on concurrent end-users per year contains an unlimited number of solutions and all features. One all-in-fee for number of users of your solution(s). User packages with 20, 100, 500, 1000, 2000 and 5000 users. Additional user packages with 5000 users available. Annual Subscription including license and software assurance. Pay per year or per month in EUR, USD and CHF. Includes Package 2 with "Forms". Your very cost-effective package based on concurrent end-users per year contains an unlimited number of Forms and actions. One all-in-fee for number of users of your forms & actions.